Apple has just sent out invitations to its iPad 3 event, set to take place at 10am PT on March 7, at the Yerba Buena Center for the Arts in San Francisco. The invitation includes the words, “We have something you really have to see. And touch.” Long know for its enigmatic invitations, Apple is likely alluding to the next-generation iPad’s new screen, which is expected to have twice the resolution of the iPad 2. Earlier today, CNBC created some confusion about where the iPad 3 unveiling would be held. At about 11am ET, CNBC tweeted that a “quad-core iPad 3 with 4G LTE” would be unveiled next week in New York City, according to “sources.” The location part is, we now know, obviously wrong. The question is: Will the rest of the information be right? So far, the rumor that the next iPad would have a “Retina” display, similar to that found on iPhone 4/4S, has seemed the most solid. And considering Apple’s invitation message, that rumor is all but confirmed. The other rumors, that the iPad 3 would pack a quad-core processor, and that some models would included LTE connectivity — something not offered in the iPhone 4S, which only has HSPA+ connectivity — are less sure. Fortunately, we’ll only have to wait a few more days to find out. In addition to a better screen, faster CPU and GPU, and possible LTE connectivity, the iPad 3 (or whatever it will be called) is expected to be the same size as the first two iPad models (9.7-inches), and to have better cameras on both the front and back — a much-needed upgrade. So there you have it, folks: Mark your calendars for March 7. 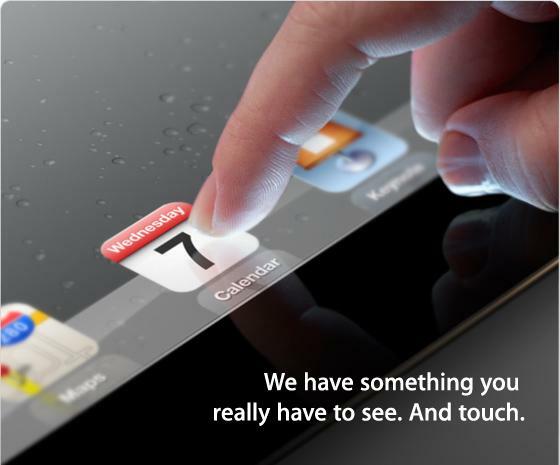 The iPad 3 is coming.